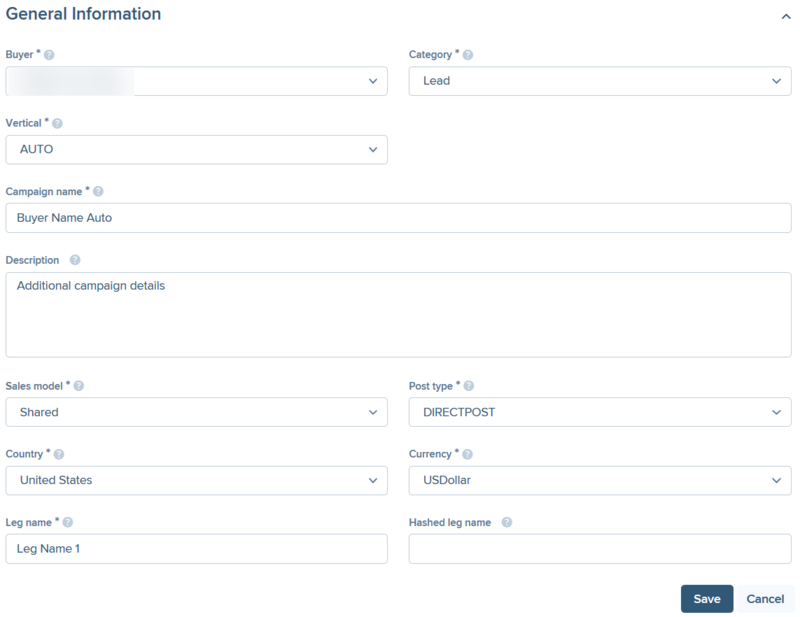 Campaign is a set of buyer configurations created in PX platform in order to start a lead (click, call, or data) flow between particular publishers and buyer. All campaigns are easily scaled across all verticals. To create a new campaign, go to Campaigns and click Create campaign at the top of the page. General settings describe basic configurations of the campaign. 2. Category - select the appropriate category (Lead, Call, Click, Data, Other). 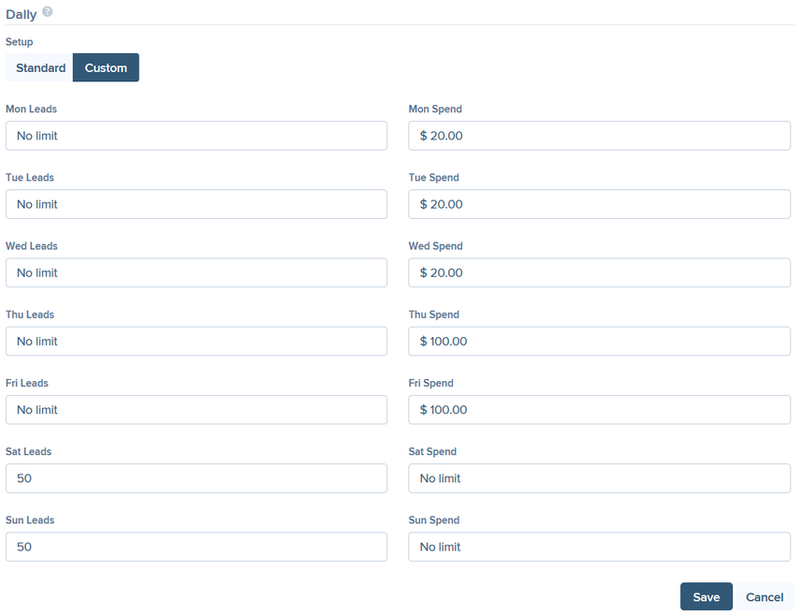 Depending on the category selected, different fields and page blocks become available. 3. Vertical - select a vertical for this buyer campaign. 4. Campaign name - enter the name of the campaign, avoiding special characters. It is recommended to combine Buyer Name, Type and Vertical (e.g. BuyerNameExclusiveAuto) in order to keep data organized and simplify support process. 5. Description (optional) - enter any additional campaign details. 6. Sales model (lead category) - select the sales model for the campaign (None, Exclusive, Shared, Undersold, Mixed). 7. Post type (lead category) - select the type of lead posting for this campaign (PING POST, DIRECT POST, BULKPOST, EMAILLISTPOST, LEGDELIVERY). 10. Leg name (lead category) - enter a unique leg name avoiding special characters (mandatory field for shared and mixed campaigns). It is recommended to use letters. 11. Hashed leg name (lead category) - enter hashed leg name according to the agreement with the buyer (optional field for shared campaigns). Commercial settings describe financial configurations of the lead сampaign. 5. Payout Quality(%) - the percentage of your confidence towards a buyer regarding payout obligations. Campaigns of the same buyer can have the same destination number. Assigning a new number to the campaign can take up to 15 minutes to update. 1. Call payout - the default payout paid by the campaign for one successful call forwarded to it. 2. Call duration - the minimum call duration in minutes and seconds that defines the call as successful and eligible for payout. 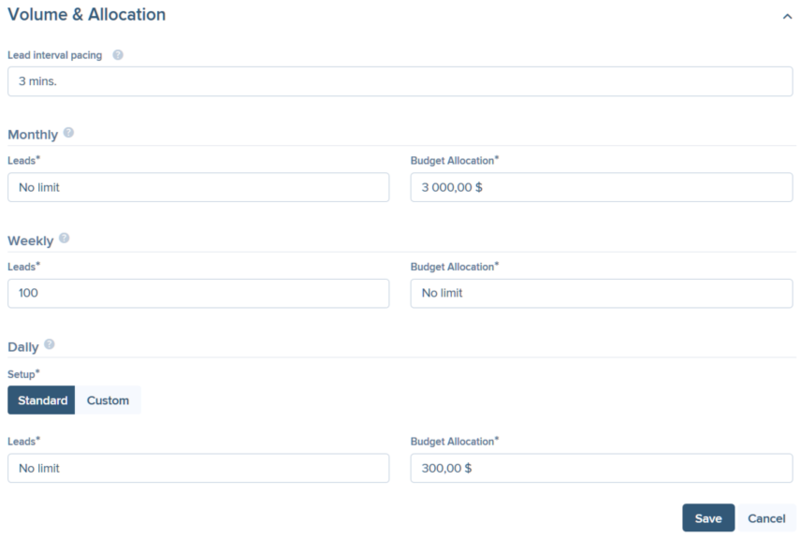 Configure additional payout rules in Payout Management. 1. Lead interval pacing (lead category) - set the minimum interval, in minutes, during which the campaign won't receive any new leads after the previous lead was bought. The next set of configurations is related to lead capacities and budgets for this campaign. By default, No limit is set for each capacity and budget. 2. Leads - the maximum number of leads/calls that this campaign can buy in one month. If monthly capacity and/or budget is reached, the platform doesn't post leads and forwards calls to this campaign until the next month starts or this cap (budget) is increased. 4. Leads - the maximum number of leads/calls that this campaign can buy in one week. If weekly capacity and/or budget is reached, the platform doesn't post leads and forwards calls to this campaign until the next week starts or this cap (budget) is increased. 6. Leads - the maximum number of leads/calls that this campaign can buy in a day. If any daily capacity and/or budget is reached (either standard or custom), the platform doesn't post leads and forwards calls to this campaign until the next day starts or this cap (budget) is increased. 1. Source quality ceiling - select the maximum publisher tier to post leads to this campaign (Platinum, Gold, Silver, Bronze, Nickel, or Coal). 2. Source quality floor - select the minimum publisher tier to post leads to this campaign (Platinum, Gold, Silver, Bronze, Nickel, or Coal). 3. Escore floor - enter the minimum Escore for leads posted to this campaign. 50 is recommended. Click Save as soon as you are done with Campaign settings.